The benefits of ensuring that your attic insulation is thorough and efficient could mean the difference between spending thousands of dollars on heating and cooling and saving thousands of dollars on heating and cooling. Refuge Roofing & Siding has the experience and expertise to make sure your house is prepared to keep you warm as the winter months approach, and to cost you less while doing so. If you take a look at your attic and notice that your blown-in insulation has settled below the floor joists, your home is not being properly insulated. 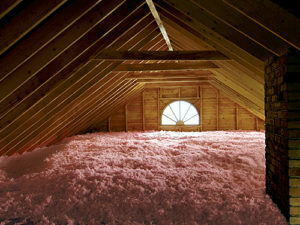 Adding more insulation will provide instantaneous benefits to your home’s efficiency and to your bank account. Visible floor joists indicate the probability that the cold air of winter is penetrating your home. This means that your heating system has to work harder to maintain your preferred temperature setting and can, over time, put added stress on your heating unit. Inefficient heating can eventually translate to unit failure, which can be an extremely expensive proposition. Adding insulation to your attic allows your heating unit to work as it was intended to, extending its life-span and costing you less money. Refuge Roofing & Siding has earned an excellent reputation because of our commitment to providing professional service to our customers and by administering those services with expertise. Our goal is to help you feel secure in your home. Minnesota is known for its frigid winters and feeling confident that you have adequate insulation to keep you warm during the winter is something we can provide. An added benefit of our insulation service is that it also has the effect of keeping your house cool in the summer months. The rest of the country may think of Minnesota as an arctic wasteland, but we know different. Summer in Minnesota can be very hot. Adequate levels of attic insulation is just as important for keeping your house cooler in the summer as it is for keeping your house warmer in the winter. Insulation is not a topic that you are likely to think much about, at least not until you begin to see your heating and cooling bills rise. If you become aware that your insulation is related to rising energy costs, it is not likely that you will be able to safely add more insulation to your attic. So let us do it for you. Our staff are experts in the installation of attic insulation and we would be happy to help your house get back to a state of efficiency. Give us a call at (651) PRO-ROOF and we will respond to your request promptly.